Longboard in comfort /security with the Beyond 10' (3 m) Mal Ankle Leash. Shop / Surfboards and Accessories / Leashes / Beyond® Longboard Leash – 10ft mal ankle. 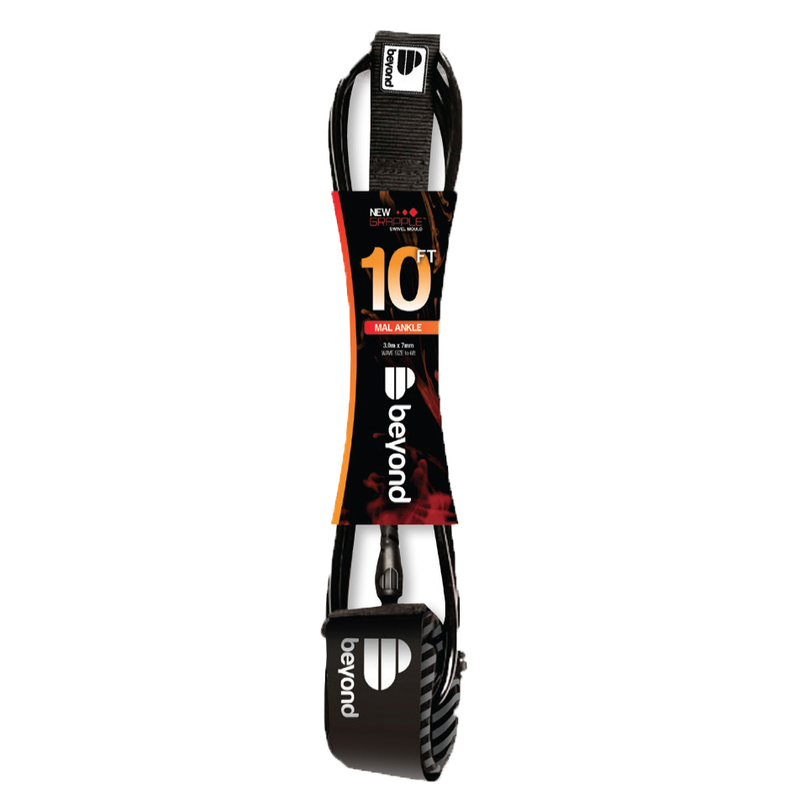 Beyond® Longboard Leash – 10ft mal ankle. Beyond® Accessories – Beyond the Expected. Designed for use in up to 4-6 ft surf, the Beyond® 10′ (3 m) Mal Ankle Leash is ideal for the mal or longboard surfer wanting a lighter-weight leash in smaller surf, but still with total security. Our leashes feature the engineer designed Grapple moulded anti-twist connector, spreading stretch load over greater distances, dialing out areas of weakness and giving you total security where it’s needed most. 40 years of surf experience and scientifically engineered for reduced breakage, with the best urethane cord and webbing we can buy. Trust when you need it. You might prefer the Beyond® 10′ (3m) Mal Knee Leash instead…. Beyond® Accessories – Beyond the Expected. Our packaging is ‘Kinked’ so your leash isn’t. Its designed to reduce kinking and tangling by allowing the leash cord to hang in a fuller arc.